A few weeks ago, Dr. Marlene Behrmann gave a talk to my Science Writing class. We were then allowed to ask her questions and had to write an interview article on her. Below is my first draft of my article. I wrote this in about 3 hours and turned it in at 12:30AM when it had been due at midnight. Needless to say, I was pleasantly surprised to still get a C+ on it. Not my ideal grade, but way better than I thought I would get. I'll definitely be putting more effort in on the rewrite. A woman drops her daughter off in the morning at day care. The daughter happens to spill some paint on her clothes during playtime, so the teacher tells her to change her shirt. At the end of the day, the woman returns to pick up her daughter but cannot find her amongst the children. She patiently waits for the teacher to bring her daughter over to her. This woman has a condition known as prosopagnosia, meaning she cannot recognize faces. People with prosopagnosia rely on non-facial queues to identify people, such as clothing or voice. When the daughter changed her clothes, her mother no longer had a visual clue to identify her daughter. She was forced to rely on the honesty of the teacher to retrieve her daughter. The simple act of recognizing a face is something most people take for granted, but in reality, approximately two percent of the general population suffers from face-blindness known as prosopagnosia. Well, I received some feed back from classmates and from my teacher in Science Writing. Here's the final draft of my explanatory article on 5 Hour Energy. I'll let you know what I get for a grade . . .
Perhaps you’ve just finished your lunch and are feeling a bit sleepy, or you want to stay up late to finish that project and study for your finals. A jolt of energy to get you through the next few hours would be great. One increasingly popular way to get a quick boost is drinking a two ounce bottle of 5 Hour Energy. Since I'm a vegetarian and my roommate/boyfriend is not, dinners can be something of a challenge. Normally he will not eat tofu and dislikes it's texture/taste, but for some reason he cannot get enough of tofu pad thai. 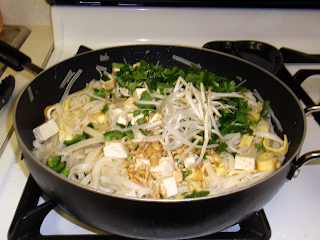 One of my favorite cookbooks is "How to Cook Everything: Vegetarian" by Mark Bittman, and it was in this cookbook that I found a magical recipe for tofu pad thai that my meat-eating significant other loves. I couldn't find a link to the recipe online, but I did find a link to Mark Bittman's non-vegetarian version here, where he lists the vegetarian version options at the bottom. For me, I like to switch up the kind of hot peppers I use in the recipe depending on what looks good at the grocery store that week. In the pan below, I used jalapeños, but in the past I have enjoyed using serranos. I also had some trouble finding pure tamarind paste at the store, so I just bought some "pad thai sauce" that had tamarind as the first ingredient listed.